After many attempts to make all sorts of LED-conversions I finnaly found one solution that is simple and efficient. Of course, you do need a great amount of patience in making this but when you consider the countless hours of pure light -low consumption you’ll get, it’s all worth it. 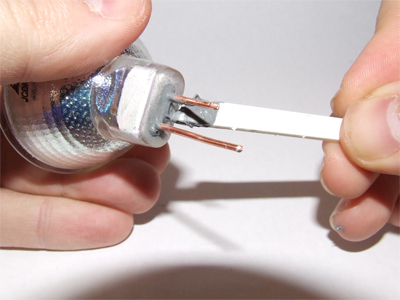 This tutorial is about converting regular GU4(MR11) halogen bulbs to LED bulbs while maintaining full usability as 12V light bulbs that can be used in indoor task or accent lighting. one halogen bulb (burnt or new since they are really cheap) with no glass cover on front. 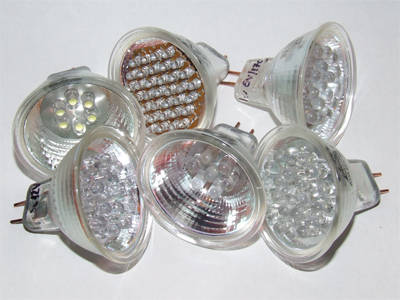 LED’s – as many as you want. You may want to keep this number reasonable since more than 22 LED’s will make you work painful. online acces to http://led.linear1.org/led.wiz , a great LED array calculator you can use to figure out the resistors you’ll need depending on your number of LED’s and the supply voltage. Super Glue & compound glue. You can use other glue as well but super glue sticks fast and I recomend it. one small piece of 0.2mm aluminium sheet (this is used in printing industry, I work in this field and there are a lot of aluminium plates around here). Any offset printing shop will be kind enough to give you a used one since they use hundreds each month. a few other common household items along with a good amount of patience. Step one – empty the bulb. 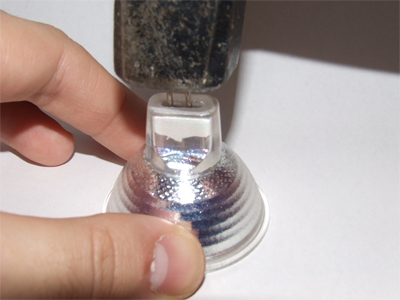 Start by taking a small screwdriver and twisting its tip on the white cement you’ll see around the bulb’s pins. This cement is very fine and will start crumbe as a fine powder as you keep twisting the screwdriver’s tip. Proceed with this until you get enough cement out for the next phase. Patience is a virtue so take you time and be gentle since the bulbs can easily break if you force you way in with the screwdriver. Action time. Take a hammer and after you got out out as much white cement you could, put the bulb face-down on a flat surface. Hit the two pins with the hammer, in a easy but ferm manner. 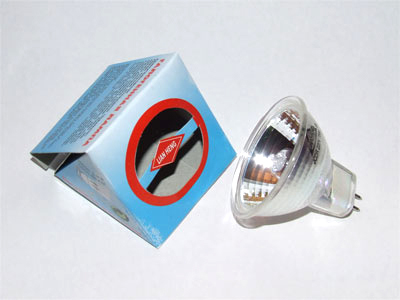 The bulb inside should fall on the table leaving the reflector empty. Some white cement will remain but that’s OK, it’s not so important and might even be useful later. Step two – make your holding disc. Put the empty reflector aside since it’s time to get to another task. It’s now time to make the LED support. You’ll need a template so make yourself one. I used graphic software to evenly distribute the 5mm holes on the disc. The disk size is up to you. 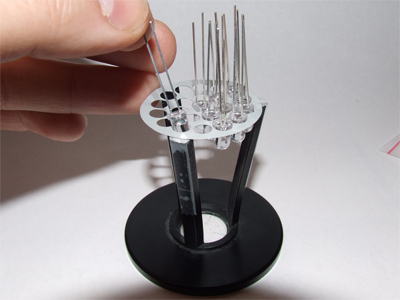 More led’s will require larger disks. Print your template on paper and cut it out with paper scissors. Place it on the aluminium sheet and light glue it on its surface. This will be useful to cut the disc properly. 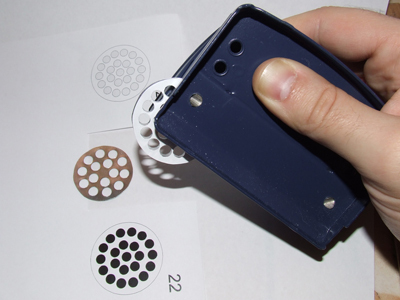 Take the aluminium sheet and cut out the holes using a office perforator. I found out mine cuts exactly 5mm holes in paper so for 5mm LED’s it’s perfect. Keeping it upside down, place the template along with the aluminium disc glued on it inside it. 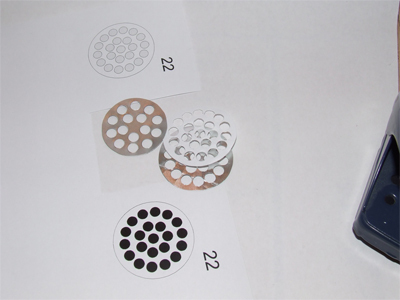 Cut out the holes after aligning the circles in the cutting hole. This should be easy and fairly quick. 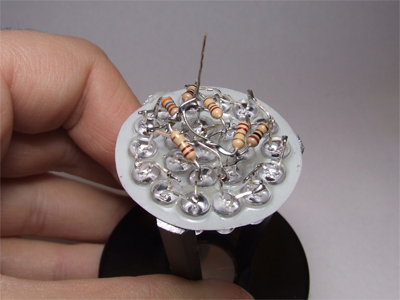 For this tutorial, I’ll use 22 LEDs and a disk diameter of 4 cm. In this picture you can see another disk I made for 15 LEDs. It’s easy and if you practice a little you can make this in minutes. 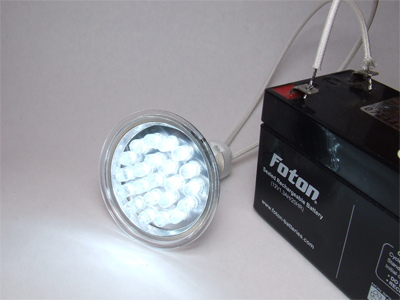 The aluminium sheet will serve as a light reflector and a holder for LEDs in the same time so take care not to bend it. After cutting out the holes it”s time to see how the led’s should be connected. Go to http://led.linear1.org/led.wiz and fill in the fields with your parameters. 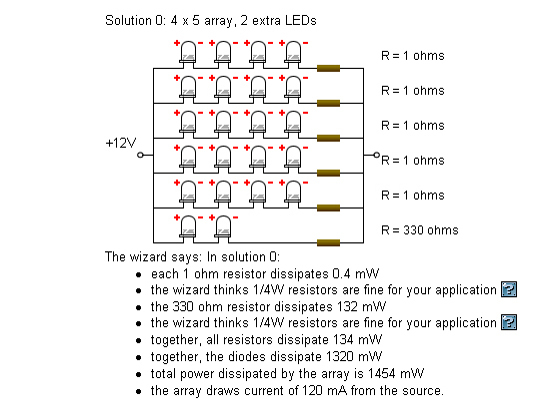 Here’s a screenshot of what the wizard reccomended for my 22 LEDs 12V array. So now I know how to connect them. 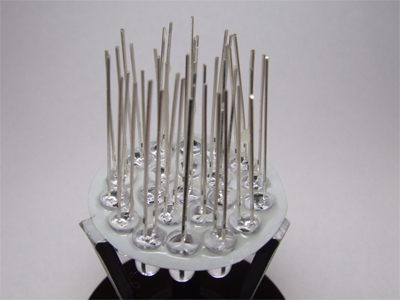 Place the aluminium disc in some holding device (I have one like the one in the photo and it’s great). Be creative with this, basically you have to hold the disc by its outer rims. For example, a pipe section with proper diameter will do. 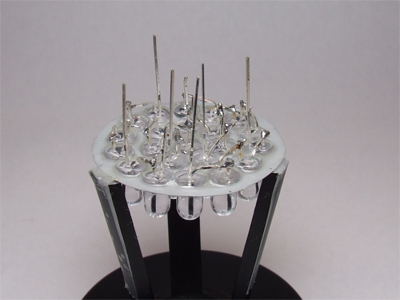 Insert the Leds into the holes with the legs up and arranged in such a manner that one cathode is next to another anode. This will make soldering easy. Don’t forget this or you will have great difficulties soldering them according to the scheme. 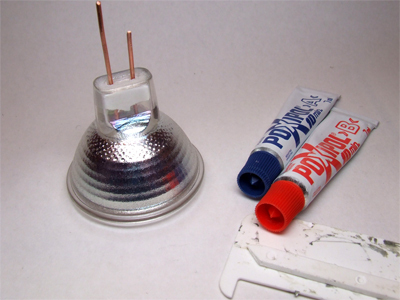 After all LED’s are placed and glued, put compound glue around each LED for a solid result. 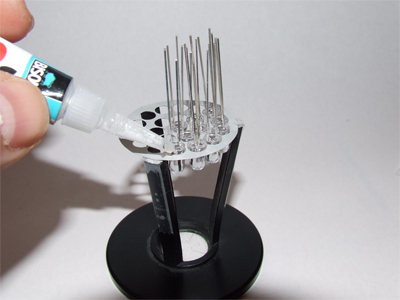 It is necessary to glue them firmly since the legs will have to be bended and you’ll risk some leds to come off otherwise. (that’s experience speaking) Now let the glue to harden before proceeding. In my case this meant 24 hours but the result was worth it. Take one nailclipper and cut out the LED legs, keeping in mind that one anode will have to be bent over to the next cathode and so on. Also take care not to confuse the two of them. You can check that with one multimeter set to diodes. As the scheme advises, I’ll have to make 5 strings of 4 LEDs each and one string of two. Since I arranged the leds in such a fashion that one cathode is next to another anode, this operation is much easier. 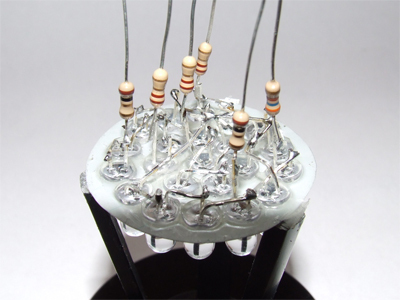 After soldering one string, keep the end legs at different lenghts to easily identify the + and the – end. Take the nailclipper and cut the LED legs and bend them to the next leg. The + goes to a – and so on until you complete a string of four. Then start a new string. When you’re done making all the strings according to the scheme, you should have six + legs longer than the six – ones. It’s time to solder the resistors. But first bend the longer legs toward each other and solder them to have all the + legs connected together. This should be done over the other connections keeping some distance to prevent short-circuits. 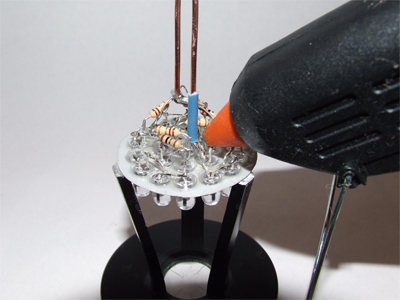 The resistors should be soldered vertically to the – legs. 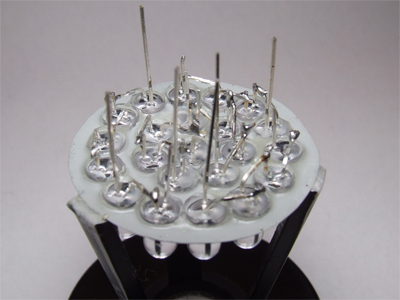 When soldering, try to be as quick as possible sice you’ll be heating the LED legs close to their base and too much heat will damage them. 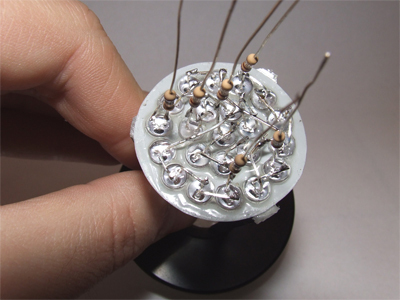 Now solder the resistors legs to each other in order to get a single – that goes to all the strings. Try to keep a low profile so that the whole thing will fit the bulb. Now solder the final legs. Use copper wire (thicker) and keep in mind that one (-) has to be shorter. The whole thing should now be pretty rigid since so many solderings were made. 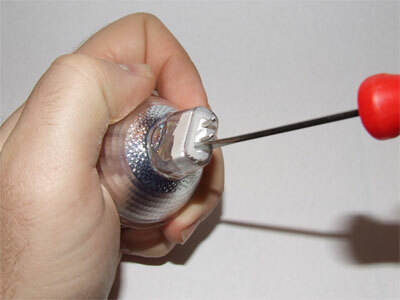 But for your peace of mind, use a hot glue gun to fill the gaps so that no wire accidentally touches another. This is optional. 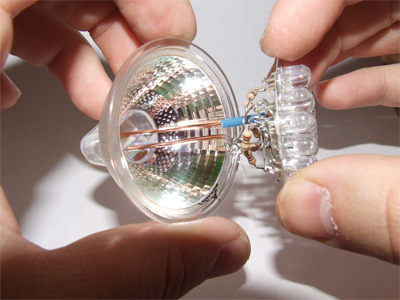 Now take the empty bulb and put the LED disc inside. The space should be enough if you maintained a low profile when soldering. It fits perfectly. 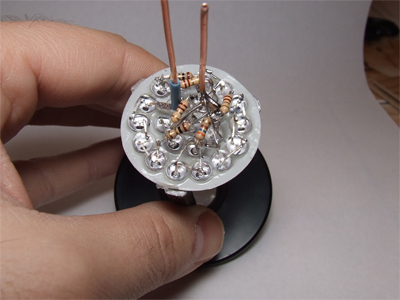 Push the LEDs until the disc touches the inner reflector. Hold it still and get the compound glue now. I used some bicomponent glue but any glue with increased consistency should do. Just make sure it’s strong enough since it will be the only thing that holds the bulb in one piece. 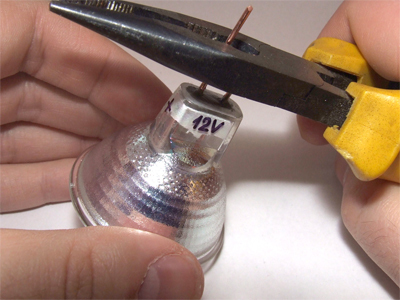 Fill the space around the legs coming out of the bulb with as much glue it will take. Wait until the glue hardens. In my case it took 10 min. and I held the LEDs pressed in the whole time. 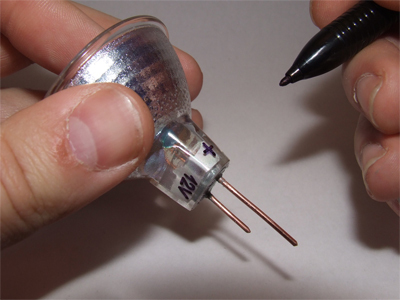 After it hardened, use a permanent marker to write on the base the + and – legs as well as the voltage it will use. Now cut the legs so that it matches the original bulb legs, equal in lenght. It’s working! The photo actually does not display the amount of light generated as it’s blinding if you stare into it directly. I had to seriously under-expose to make this visible. You can use any type of 5mm LED to make ledbulbs just make sure you know the forward voltage and current since it will be necessary when calculating resistors. I made blue, red, yellow and white ones, with successful results. I also made 6V LED bulbs I use in flashlights, replacing the entire flashlight mirror with one of this bulbs. In this case, the current consumption should be ( according to the scheme ) 220mA. It actually uses only 200 mA, or at least that’s what my multimeter says. Here are some LED bulbs I made, 12V and 6V ones. They generate virtually no heat and the most powerful one I made takes 12V@200mA and has 6 pcs. of 0,5W LED’s. These LEDs were pretty expensive but the light output is great. The type of LED’s you use is important since a more dispersed light will be better than a concentrated one. 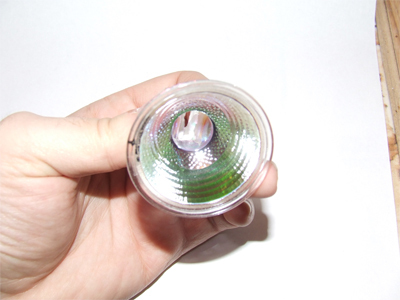 You could also file the LEDs prior to making the bulb so as to have a more uniform light. 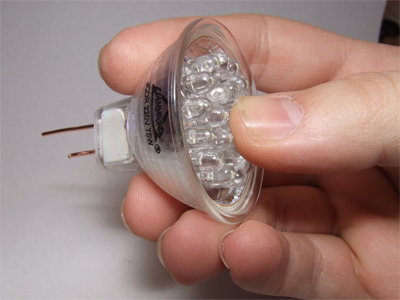 These LED bulbs can also be used in 12V AC spot lamps if you don’t mind the 50Hz flicker. But the best results will come out from 12V DC. Many thanks to all the members of this forum. I learned a lot here and I felt the need to give something back. I hope it will be useful to many people. Feedbacks, comments and opinions are welcome. 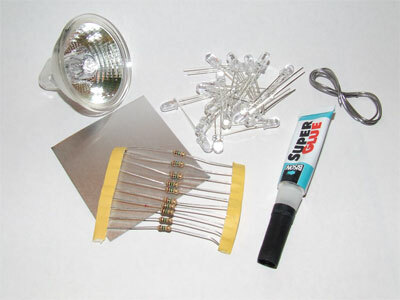 Tags: How to make your own LED bulbs.